For the second year in a row, TD Bank Group sits at the top of Global Finance’s ranking of the Safest Commercial Banks. The Canadian financial institution carries an AA+ rating from Moodys and AA- ratings from both Fitch and S&P. The three large Singaporean banks—DBS, Oversea-Chinese Banking Corporation and United Overseas Bank—boast the same ratings as last year, but are ranked below TD Bank Group on the basis of smaller asset size. TD Bank placed 10th in Global Finance’s overall list of the 50 Safest Global Banks. DBS came in at number 11. OCBC took the 12th spot; United Overseas Bank was one notch below that. Seventeen of the World’s Safest Commercial Banks are based in Western Europe. It’s a strong showing, but not as impressive as how Western European banks fared in our Global Safest Banks ranking, where banks located in that region hold the top nine places on the list. Overall, they contribute 22 banks to the top 50. Germany’s DZ Bank is the only financial institution from Western Europe to be ranked in the top 10 (at number 10) on the list of the Safest Commercial Banks. US banks have a bigger presence on the Safest Commercial Banks list than the Safest Global Banks ranking, where they claimed only three spots. All told, American banks occupy eight places in the commercial bank rankings. Led by TD Bank, Canadian financial institutions take seven of the 50 positions. Australia contributes five banks. This year’s ranking of the World’s Safest Commercial Banks includes four new entries: Pictet & Cie and EFG, both from Switzerland; LGT Bank from Lichtenstein and New Zealand’s Kiwibank. Shizuoka Bank, based in Japan, was downgraded by Moody’s in December 2014 and thus falls out of the top 50 ranking. Three other financial institutions drop off the list: Norinchukin Bank and Shinkin Central Bank from Japan and Germany’s WGZ Bank. Only five Asian banks appear in the Safest Commercial Banks ranking, compared with 10 in the Global Banks ranking. No commercial banks in China or South Korea scored high enough to make the list. The Bank of Tokyo-Mitsubishi UFJ is Japan’s sole representative among the 50 Safest Commercial Banks, and it falls 17 places this year to 50th. The drop stems from Moody’s downgrade of the bank in December 2014. No Japanese banks appear in the global ranking. Five banks from Gulf Cooperation Council member states appear in the Safest Commercial Banks ranking: three from Saudi Arabia, and one from Kuwait and Qatar. Two Chilean banks appear in the ranking. Banco de Chile’s score lands it at number 37 and Banco Santander Chile at number 49. The highest-rated bank in Chile, BancoEstado, is state-owned and so not eligible for inclusion in the Safest Commercial Banks rankings. The same is true of National Bank of Abu Dhabi, which heads the rankings of the World’s Safest Emerging Markets Banks. 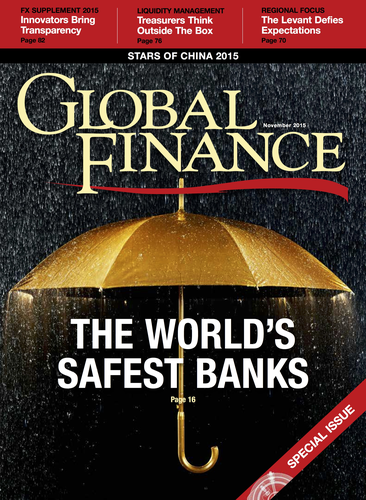 Global Finance’s ranking of the World’s Safest Commercial Banks is made up of financial institutions that are not majority-owned by a government or state agency. The other criteria are the same as those used for ranking the Safest Global Banks and the Safest Emerging Markets Banks. A score of 18 points, equivalent to three A+ ratings, was needed to ensure inclusion in the Safest Commercial Banks ranking, although Bank of Tokyo-Mitsubishi UFJ claims the final place with 17 points. Seven other banks have 17 points, but with lower asset sizes than the Japanese bank they were not included in the top 50 ranking. The seven banks were: Credit Suisse, Norinchukin Bank, Shinkin Central Bank, Shinhan Bank, Shizuoka Bank, Banque Saudi Fransi and SABB.